FUE Hair Transplantation in Jaladhar, Punjab has been considered as the most advanced and reliable solution for hair loss of any level. It is the procedure that offers natural, smarter and younger look to patient by restoring full head of hair and confidence. 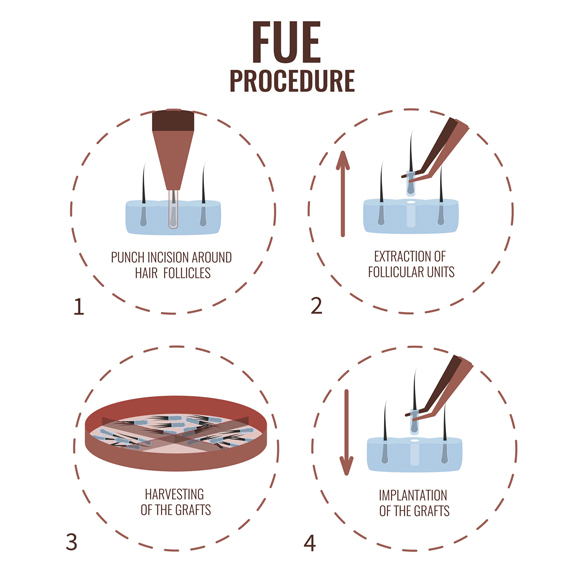 Follicular unit extraction or FUE method is the advanced method that has less down time and quick recovery period as in this procedure individual hair follicles are extracted and implanted instead of strip removal from back head. Before performing FUE surgery in India patient’s candidacy for the procedure has been examined so that permanent and reliable results can be offered. In the first meeting with the patient our experts examine the physical and mental health of the patient as best health of the patient is essential for performing FUE surgery. Then through the digital scalp analysis extent of hair loss problem and root of the problem has been identified so that patient can be provided with the estimation of outcomes after surgery. Before surgery patient’s hair texture, quality and loss resistant properties have been examined to determine the donor area for the surgery. On the surgical day, patient has been given local anesthesia so that painless surgery can be performed for hair restoration. Then micro punches of having diameter less than 1 mm are used to extract loss resistant hair follicles from the permanent zone of head according to the requirement of patient. Then with extensive care grafts are placed in the pre created tiny holes at correct distance, angle and direction to give desired look and density of hair to patient after surgery. Grafts are placed according to expectations of the patient. After the completion of surgery patient is asked to take rest of 2-3 hours and is monitored, after that patient can go back to his home without any difficulty. However FUE surgery is non invasive and patient can experience safe and risk free results still after surgery patient is given some instructions to care his transplanted hair and to optimize the after surgery results. Immediate after surgery patient can experience mild swelling, redness and even some time itching in the donor or recipient area but it is normal and it gets vanished in 3-4 days automatically but if it does not , then patient is recommended to visit center again for the proper medication and care to minimize these effects. Patient can resume his daily activities soon after the surgery but is asked to avoid some heavy physical activities and dangerous sports for at least 10 days. For best results and quick recovery patient is asked to have nutritious diet and precautions after surgery. Follicular unit extraction method ensures the natural and reliable results after surgery. however in 3-4 weeks patients can experience some shedding of transplanted follicles but it is normal and after some time transplanted follicles start growing like the natural hair so patient can have noticeable results in 4-5 months but actual results of full head of hair with natural look can be seen within one year.